Close unsightly spaces between your teeth. Fix your cracked, broken or injured teeth. Make your stained or discolored teeth more beautiful. Restore your teeth that are congenitally missing. A more secure smile. Have your teeth been making you feel insecure about offering a smile displaying them? If so, when you have a beautiful smile, you feel like you can securely smile with no worries about your embarrassing tooth issue. A more confidant smile. When doing business, a full smile can make you more confident in your dealings, focusing on the business at hand, and not being distracted by your smile dissatisfaction. A more photographic smile. Go ahead and take those selfies. Step out from behind the picture taking, to the front of the camera as the person being photographed. 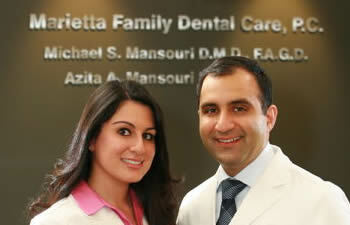 Call Mansouri Family Dental to see if porcelain veneers could give you the smile that you’ve desired. We will explain how this esthetic dentistry can enhance your smile. If they are right for you, we will make impressions of your teeth through a quick and easy process. Lastly, your amazing new smile is bonded into place and ready to wear. Book your appointment with us today to get you on the road to a more confident, secure and photographic smile.